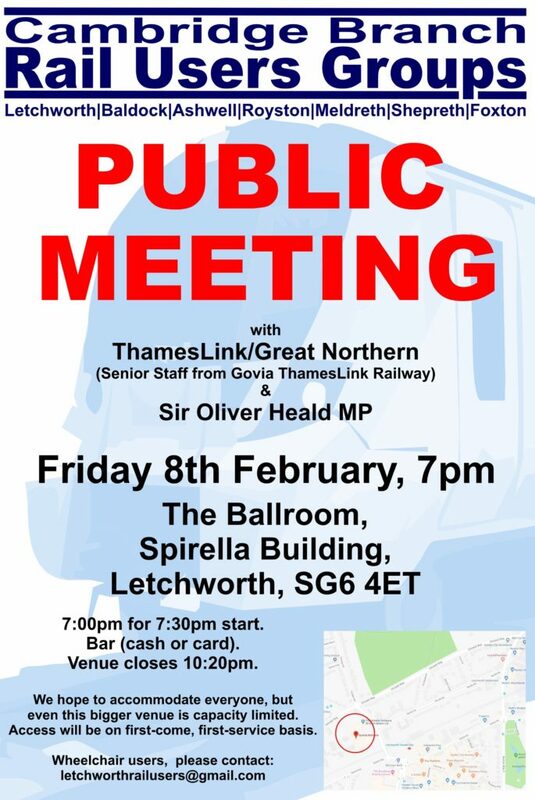 There will be a public meeting for Cambridge Branch RUGs (Royston, Letchworth, Ashwell, Baldock and Meldreth, Shepreth and Foxton) with Govia Thameslink and Oliver Heald on 8th Feb at the Spirella Ballroom in Letchworth. Doors will open at 7pm with a view to starting promptly at 7.30pm. It would be great to have some support there for the Meldreth, Shepreth and Foxton User Group. Note that issues relating to our stations will be discussed, including restoration of semi-fast services and improving access at Meldreth.